At Southernwood we put a strong emphasis on the arts. We believe that weekly drama sessions help to develop the children’s language and imagination as well as giving them the opportunity to problem solve and make decisions in a safe environment. 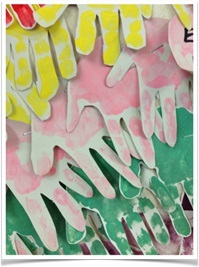 Individual and group art projects are part of our daily routine and children are taught to use scissors and glue. Activities are carefully planned so that they utilise these skills. To compliment theme work, they make many three dimensional models. The children work with templates and stencils and are taught to draw and paint with care and accuracy. We assist and guide children rather than do the work for them. Activities are planned within the children’s ability range to create a sense of personal achievement. They have unlimited access to painting freely at the easel and to colouring, cutting and drawing, as we believe that this has equal importance to the guided work. We sing every day and have regular music sessions with instruments, which are often accompanied by our resident musicians (Rob and Anna) or our Old Time Banjo player – Guy. We use the language of music to help children develop their awareness of rhythm, tempo and pitch. We have regular circle dancing and singing indoors – or when the weather is good, in the garden.